← Old and Gnarly Can Be So Beautiful! Nobody said being a caregiver was easy, but the person who is the hardest on you is most likely you. You think you can handle it all and keep the weight of the world on your shoulders, but the problem with that is you’ll eventually cave under that weight. A caregiver support group can help. Being a caregiver often gives you the sense that you are isolated. You spend all of your time with the elder under your care, which can leave you feeling lonely. Family members also have high and often unrealistic expectations of you, which might leave you feeling judged when you don’t meet those expectations. 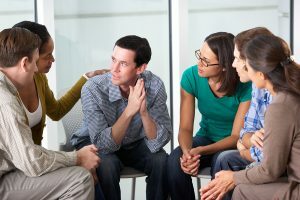 You will find others experience the same feelings in your support group and they can offer sympathy, support, and share their coping mechanisms with you. Speaking of coping mechanisms, one major benefit of a caregiver support group is everyone will share their stories and the various ways they cope with their daily responsibilities. You may be going to the support group to receive help from its members, but you’ll help others in your shoes as well. Swapping coping mechanisms gives everyone new tools they can employ in their daily jobs, plus you can all brainstorm to find solutions to difficult problems that do not have an easy fix. Many caregivers suffer from depression because the situation can feel dire. When you have others to talk with who suffer from the same chronic sad feelings you do, you will find your depression becomes more manageable. This does not negate the need for professional help, though, so keep this in mind. The support is an added benefit to the treatment you may need or are already under. All of these benefits equal thing: more control. If you’ve had a bad day, you cannot take it out on your elder. Caregiving requires the patience of a saint, as losing control could lead to unneeded stress for the elder as well as other people who care about you both. A support group is there to alleviate your frustrations so you manage your emotions effectively. Your time as a caregiver is one of the most difficult situations to be in, so be gentle with yourself. Feeling depressed, helpless, isolated, judged, and even out of control are common in caregiving. Other caregivers feel the same way, so listen to them, support them, and let them support you. If you or an aging loved-one are considering Caregiver Services in Apopka FL, please contact the caring staff at Flourish in Place Home Care Solutions today. Proudly serving Orange, Osceola, Seminole, and Brevard Counties. Call 407-845-9797. This entry was posted in Caregiver Apopka FL, Stress and tagged Caregiver Apopka FL. Bookmark the permalink.